If you want to add forms to your WordPress website, there is no shortage when it comes to options. However, despite all the choices that are available, not all WordPress form plugins are created equally. Some are designed for advanced users, some are for complete beginners, and some are for the rest of us stuck somewhere in the middle. 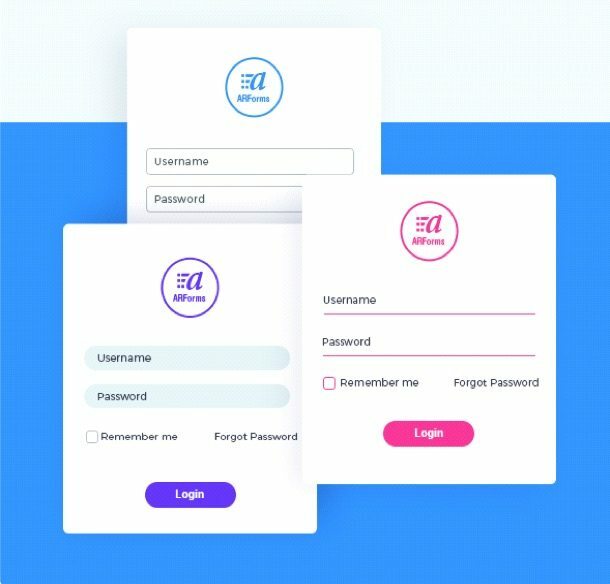 The key is to find a form plugin that offers enough advanced functionality and design that you can create something truly unique, but not so complicated that you get lost trying to do so. That’s where ARForms comes in handy. ARForms was designed to be an all-in-one WordPress contact form plugin that requires no coding knowledge to use. Instead, it comes with all the built-in design and features you could need to create simple, or complex, forms on your website. 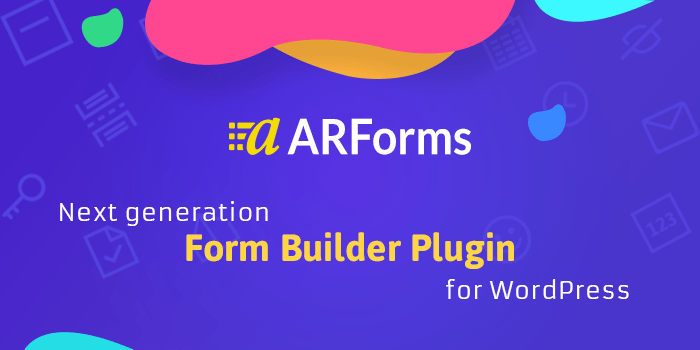 ARForms is a premium WordPress form builder plugin that has a real-time editor so you always know exactly what you are creating, while you are creating it. It comes with the fully responsive design so site visitors on any type of device or screen size will be able to not only see your website’s forms but use them as well. It was built with clean and solid code for the ultimate in loading speeds and performance. Not to mention, there is a dedicated support team on hand ready to help you with all your form needs should you run into trouble. Ready Form Templates available to save time. As you can see, ARForms has a solid foundation, and we haven’t even gotten into the main features or what things look like on the backend. Customizing your forms, no matter what kind you need is easy when you use popular WordPress contact form plugin – ARForms. 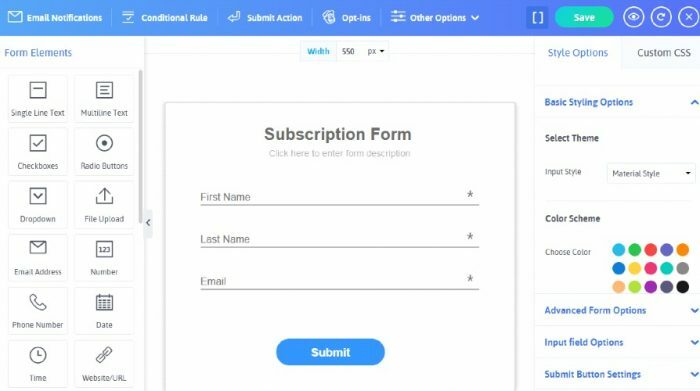 That’s because it has an intuitive backend full of features designed to give you the chance to create a one-of-a-kind form that people will want to fill out. To start, ARForms comes with the trendy material design. Unlike many form plugins, ARForms provides nothing but crisp, clear flat designs, complete with rounded and standard styles. 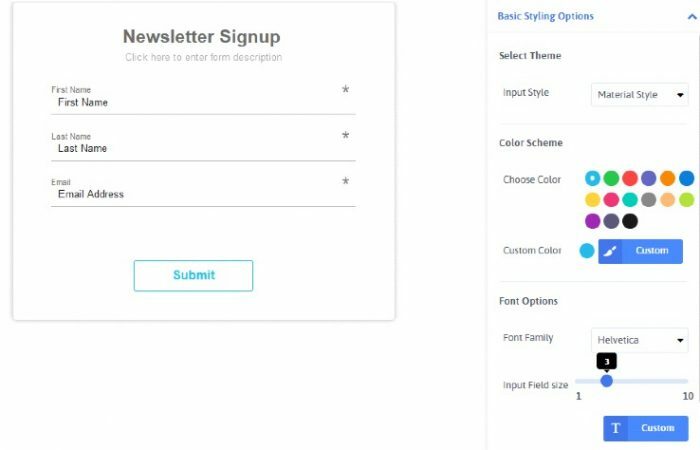 When you first start creating a form, you have the option to choose from 12 pre-made templates. For example, create a registration form, a contact, form, or even a donation form. Or, if you prefer, create a custom form using the blank template. From there, pick from 15 different color schemes, customize your font styles using Google Fonts, add multiple rows and columns to your form as you see fit, and even create custom radio buttons or checklist boxes by uploading images to them. What’s even better, ARForms gives you 25 elements to choose from that are easily dragged and dropped directly, in real-time, onto your form. Choose from elements such as checkboxes, email address, phone number, images, page breaks, and dropdown. Create a fully customized form, depending on your needs, and see how everything will look in real-time as you do it. One of the things that makes ARForms so powerful is its inbuilt popup form functionality with the various triggers. Such facility is not available in every WordPress contact form builder. 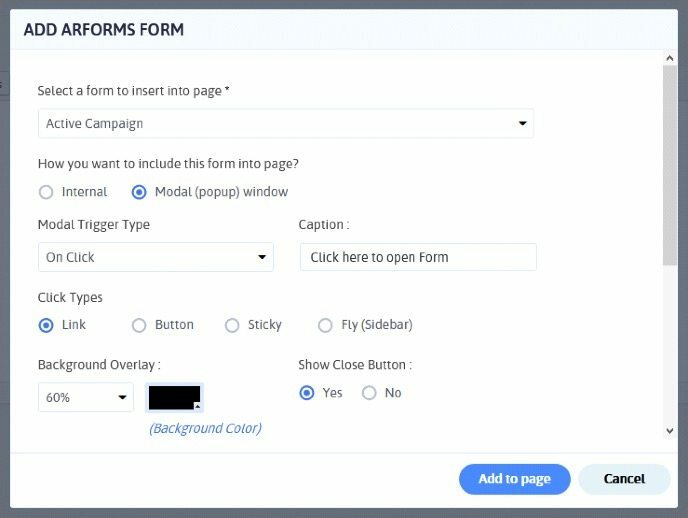 Using trigger actions you can enable on your forms to get the attention of site visitors in many ways, thus boosting your form conversion rates. Exit Intent. Remind visitors as they are about to leave your website that you have what they are looking for and encourage them to subscribe. This may be your last chance to convert a visitor into a subscriber or customer. On Idle. If you notice someone has been silent for a time on your site, reveal a form and show them why they should continue engaging with your content, ask them if they need help and give them a way to reach out, or provide a discount to secure a last minute sale. On Scroll. If a reader is scrolling through your content, clearly they are interested in what you have to offer. Why not give them a way to continue getting the valuable content you have in the form of a newsletter. Inline Sidebar. 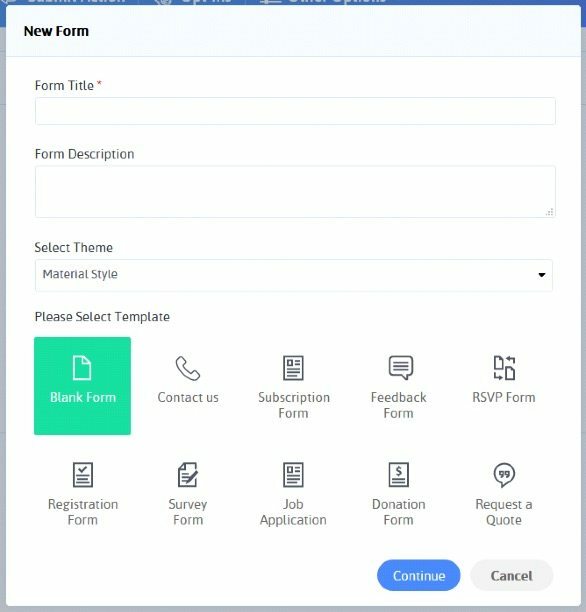 If you prefer to be more subtle when it comes to your forms, whether you are asking for a donation, looking to build a bigger email list, or are just hanging out ready to help when needed, add your form to your sidebar so when visitors are ready, they can input their information. On Page Click. When a site visitor lands on an important web page that may help your bottom line, display a form to ensure your visitor sees it and has the chance to sign up. Lastly, and perhaps most importantly, ARForms gives you the ability to enable a form display when a site visitor clicks on a specific navigation menu item. Again, this is a great way to grab the attention of site visitors in ways they aren’t used to as a way to boost conversions and even increase site engagement. One thing not many WordPress form plugins have, whether free or premium, is conditional logic. Create smart forms that react according to how your site visitors behave while filling out your form. ARForms makes this feature available to all form fields, including multi-step forms. Show or hide fields based on how your site visitors answer fields on your form. This way you only gather the right information from the right kind of site visitors. For instance, if you are looking to gather the names of your site visitors’ parents, display a separate set of form fields asking for that very information only once a site visitor begins to fill out your form. The great thing about this is you can set up conditional logic to hide and display fields however you want to. Ask previous customers questions about their buying behavior in your eCommerce shop when they fill out your contact form to see what brings repeat business. On the other hand, make sure new customers don’t see these same questions. Instead, once finding out they are a new customer, ask your site visitor what types of products they are looking for. Another important feature Arforms have is a facility to do mathematical calculations for totals and averages which can be shown dynamically on the form. And also those dynamic values be passed to the payment gateway to collect payment accordingly. So, for example, if you have a form with product listing and you want that upon users selection of one or more products and plans total amount should be adjusted then its very easy to achieve in ARForms. Arforms comes with out of the box support for 9 popular opt-in tools. So, collecting emails of your subscribers is automated. And you can send data to your choice of email marketing tool. All you need to do is configure apis and map form fields. Supported email marketing tools are Aweber, MailChimp, GetResponse, Active Campaign, iContact, Constant Contact, Mad Mimi, GVO, EbizAc etc. One of the best ways to tell if your forms are working for you, rather than against you, is to monitor the activity of your forms. This will tell you exactly what is working on your site and what needs improvement. 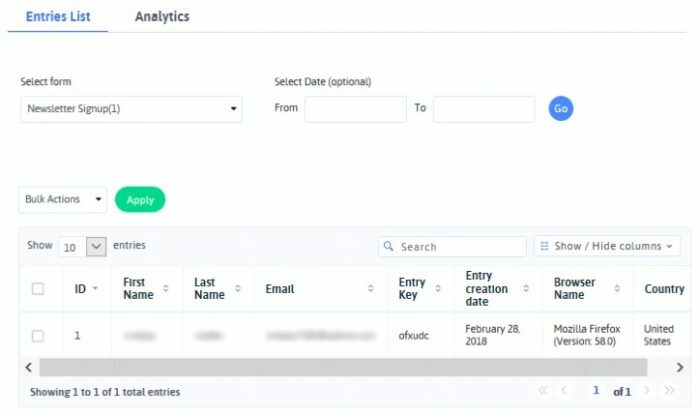 Luckily, rather than fight the enormous amount of information found in Google Analytics, ARForms makes seeing your form entries according to daily, weekly, and monthly behavior easy to do on the backend of your site. Once you have some form entries that have been submitted by site visitors, you can easily navigate to those entries from the WordPress dashboard. There you’ll see the name, email, date of entry, browser, and country of the user that submitted a form on your site. You can also check out the more detailed analytics portion to see the activity of your forms over time. You have the option to choose from a line chart, bar chart, and worldwide map chart. 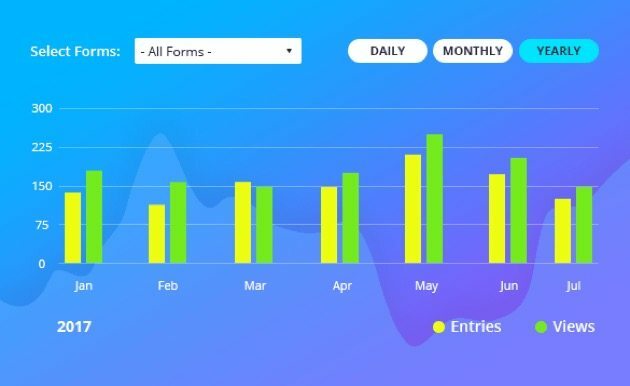 It even breaks the numbers down into the number of views of your forms have versus the number of form submissions, making it helpful to see whether your forms are being overlooked or not when site visitors view them on your site. In the end, this is a great way to learn more about your site visitors so you can cater to their needs and wants more so than you are already doing. ARForms offers a number of premium add-ons that can help extend the functionality of your WordPress forms, no matter which type you have on your website. Add the option to collect payments (donations, product/service payments, or recurring payments) on your forms using the secure, and popular, payment gateway PayPal. If you want to collect credit card payments on your forms, enable the Stripe payment gateway and do just that. net. Another way to process credit cards on your website is to use the Authorize.net addon. PayPal Pro. This advanced eCommerce payment gateway makes accepting product/service payments and recurring payments easier than ever. User Signup. Allow site visitors to register on your site, edit their profile, and change/receive their password from the frontend of your site. PDF Creator. Create PDFs out of all the data captured on your WordPress forms and even attach the data to a notification. Create subscribers for your MailPoet email lists with this powerful addon. Another email service provider integration, this addon lets you add subscribers to your Mailster email list. For times you need to collect site visitor signatures, do so right on your WordPress form, making the process seamless. Digital Download. Give site visitors the ability to download any digital download upon form submission. This is great for times you incentivize subscribers with an exclusive eBook, checklist, or other valuable downloads. Send SMS notifications through Twilio, Nexmo, Clickatell, or SMSGlobal. Though ARForms comes with built-in spam protection, you can enable reCAPTCHA technology as an added layer of security, which is especially helpful for those with membership websites that require user registrations. Post Creator. Create WordPress pages and posts, as well as custom posts, using data captured from your WordPress forms. And to top it off, ARForms will soon have Infusionsoft, ActiveCampaign, and Zapier add-ons, making your email marketing efforts even easier. ARForms has extensive documentation available to help guide you through the many features available. With step by step instructions, as well as easy to understand images, there is nothing you can’t accomplish without the help of the documentation. That said, if you do require additional help, ARForms is dedicated to providing superior customer support to their clients. In fact, the support team aims to answer all questions within 24-48 hours of a ticket submission. Support includes questions regarding the product and its features, bugs and other issues, and updates to ensure compatibility with new software versions. In the end, it can be hard to determine which WordPress form plugin is the best choice for you given the sheer number of free and premium options available on the market today. That said, if you are looking for something that is highly customizable, aims to help boost your site conversions and eCommerce sales, and yet remains easy enough for even a novice website owner to use, ARForms comes highly recommended. Couldn’t agree more. I tried about 7 different form builders, and this was the only one that checked all the boxes for my needs. Very intuitive and clean design. Also very good and detailed write-up, thanks! Nice blog , I learn easily arform so thank you so much . but sir I got a one problem in arform . when i click on submit button then i got easily my all data in my mail address but signature is not got in my mail address so if you have any solution please tell me in my mail address thankyou so much sir.